It is Athina here with you today! I hope you have had a great week and are looking forward to an awesome weekend! Here on my side, my hubby and I have made some great gains towards our future and we are super excited. So we will be celebrating a little bit this weekend! I can't wait! For today's inspiration, I had some fun with the Snowman image by C.C Designs. He looks like he is having lots of fun! This was a super simple card. I used a page from the 6x6 Fancy Pants Blissful Blizzard pack and cut it out to make the sentiment across the middle. Then I used a round circle cutter to cut out the image and a border for the image. The image itself was colored with only a few copics (BG72, BG75, BG78, W1, W3, W5, W7, E42, E44, E49 & 0). After I colored the image, I took clear embossing ink and covered the image. Then I used Sparkly Embossing Powder to add a nice shine. 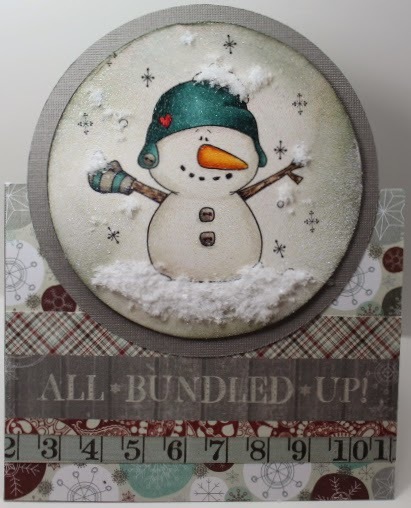 To finish it off, I used Polar White Flower Soft to add some snow and texture to the card. Laura has been teasing us with lots of new items to be added to the store. So be sure to check back often. Also, make sure to stop by and play along with us in the Shades of Green challenge. That is it for me today! I am off to celebrate with hubby! Have a great weekend and we will see you back next week.